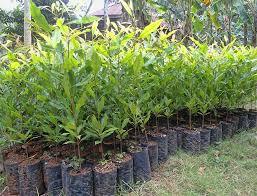 Clove plant (Syzigium aromaticum) is a plantation / industrial plant with Myrtaceae famili tree. The origin of clove plants is not yet clear, because some of the opinions of clove trees are from North Maluku, Maluku Islands, Philippines or Irian. In the Maluku archipelago regions are found clove plants in the world and this region is one of the largest cengceh producers in the world. The spread of clove plants out of Maluku island began since 1769. Seeds of these plants were first smuggled by a captain from France to Romania, then spread to Zanzibar and Madagascar. The spread of clove plants to Indonesia such as Java, Sumatra, Kalimantan only started in 1870. Until now clove plants have spread throughout the world. A clove is known as a spice plant that is used as a traditional medicine. Cloves are one of the essential oil producers used as raw materials for the pharmaceutical industry and food industry, while the use of which is considered as raw materials for cigarettes. ¨ Large flowers, yellow and dozens per hill. 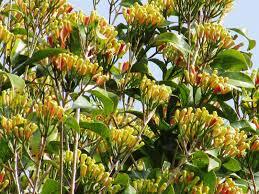 ¨ Reddish yellow flowers, every clump of 20-50 flowers. ¨ Run the best type. 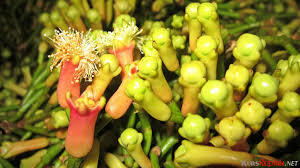 Cloves want a hot climate with fairly uniform rainfall, because this plant can not stand the long drought. A strong wind can damage canopy plants. Optimum rainfall for the growth of clove plants between 1500-4500 mm / year. Cloves require sunlight at least 8 hours per day. The optimal temperature of this desired plant is 22-30 oC, with air humidity between 60-80%. Good soil types are latosol, andosol and red podzolic. Likes loose soil with good drainage. The degree of acidity (pH) suitable for clove plants is 5.5-5.6. The depth of the soil in the rainy season is no shallower than 3 m above ground level and in the dry season no more than 8 m.
Ground with a slope of up to 20% better than flat ground, because dranasenya good. On the ground it must be made dranase ditch as deep as approximately 1 m so that the air overflows in the rainy season can be channeled in the other direction. Clove plant matches the provisions 0-900 m asl. (Most optimum at 300-600 m above sea level) or located in a hybrid of more than 900 m asl, with expanse of land facing the sea. Seeds are healthy, have strong stems with strong branching, dense leaves, are not attacked by pests and diseases, stem surfaces, smooth brownish color, and single trunk. Average height 25-30 cm age 1 year and 50-75 cm age 2 years. Spacing on a plateau 10 x 10 m or 8 x 12 m.
The location of the plants sequentially form a square or rectangle. 3. Pest and Disease Control. Common pests that attack clove plants are borers, shooters, leaf destroyers and root destroyers. Moderate diseases that often attack include Clove Wood Vessels bacteria (BPKC), Clove Leaf Pox (CDC), Dead again (dead grumbling), sooty dew. For the control can be used insecticide / fungicide as recommended. ¨ The head of the flower is full, but not yet opened. ¨ Age of clove crop harvest is 4.5-8.5 years from the end depending on the type of environment. ¨ Harvesting time there are several stages, the first if 50-60% of the number of flowers in the tree is already ripe harvest. This picking can be repeated every 10-14 days for 3-4 months. In Java, the harvest starts in May and ends July-August. It depends on the local climate. ¨ The clove flower is picked up just above the last leaf book by using a fingernail or a sharp little knife. ¨ The last / youngest leaves adjacent to the flowers should not be picked so as not to disrupt the growth of the next bud. If the leaf is picked can reduce the number of shoots 1 / 3-1 / 2 part. ¨ A picked interest is put into a pre-prepared basket or sack. Once full, flowers are put into large sacks to be taken to the processing site. Clove plants in Indonesia have a typical production period, which has the amount of production that fluctuates according to certain cycles. In certain years the plant will produce a lot of production, and in certain years the production can decrease to 10-40%. The pattern of clove plant production can be categorized into 2-year cycle patterns and 3-4 years cycle. The pattern of 2-year cycle generally have areas that have a real influence from the sea climate. In this cycle, the plant will produce high or medium in the first year, then the next year will be low. In the next year again, the production amount will return like the first year. The 3-4 year cycle generally has areas that can not influence the sea climate. In this cycle high production will recur every 3-4 years, with a varied pattern. Clove plants have two critical periods in their life cycle, ie before the plants reach the age of 3 years and after the age of 8 years, especially at the beginning and after the first harvest. The temperature of maceration and vegetable oil type gives different eugenol rendement. The powdered clove state provides a higher eugenol yield than the still intact cloves. The interaction of clove flower organ and 4 hours distillation (O3L4) was able to increase the highest essential oil yields to 6.77 (mg / 100 g of material) and also the lowest water content reached 0.27% and the lowest acid number was 2.03. Oil from clove stem (clove stem) yields average yield of 5.0%. Clove is one of the plantation sub-sector commodities mostly cultivated by smallholders. The main result of clove plants is the flowers that are harvested when the petals have not bloomed. Dried clove flower is one of the main raw materials for clove cigarettes which is a typical Indonesian cigarette. In the early 1990s, the total area of ​​cloves reached around 700,000 ha with production of 120,000 tons per year. The production has already exceeded the need of domestic cloves which were then about 100,000 tons per year, resulting in oversupply. Indonesia's clove production since 1996 has decreased as a result of price uncertainty which causes farmers are reluctant to maintain their crops. Based on clove production data, especially in 2004 and 2005 there is a supply deficit, because the needs of the clove cigarette industry averaged 92,133 tons per year. It is estimated that in the next five years, clove production will be absorbed for cigarette factory needs. Potential clove plants that have not been utilized optimally are clove leaves (deciduous leaves) and flower stalks. Processed products which can be produced from flowers, leaves and flower stalks are (1) clove oil, (2) eugenol from clove oil and (3) derived compounds from eugenol. Improving the quality of dry clove flowers through improved postharvest handling (threshing, wet sorting to separate flowers and flower stalks and dirt, flower drying and flower stalks, packaging and storage). Increased production and quality of clove flower flour as spices for household consumption and food industry. Increased production and quality of clove leaf oil (and handle / flower stalk), through improving oil distillation (distillation) technology. 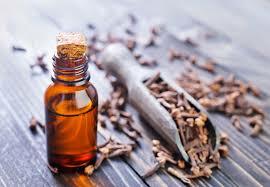 Diversification of clove leaf oil products through increased production and quality of eugenol, with improvement of eugenol isolation technology. Diversification of clove leaf oil products through increased production and quality of vegetable pesticides (fungicides and insecticides). Increase revenues / foreign exchange. Increase the value of clove added through the diversification of clove products. Clove oil has been used for centuries to treat toothache. The way is easy enough to put / apply clove oil on the hole where toothache. The results are very remarkable, the content of substances contained in the clove is believed to have very potent antibiotic properties in killing bacteria. Various active substances such as flavanoid are found in the native oil of cloves. Flavanoid works with anti-inflammatory properties that will reduce inflammation in rheumatic diseases for example. The warm taste can also be an expectorant to treat various conditions of respiratory disorders. Cloves have a variety of very powerful content to overcome nausea and vomiting, in addition to cloves, the oil is also powerful to overcome complaints of nausea and vomiting. Cloves help to relax the smooth layers of the gastrointestinal tract, so they help relieve vomiting, diarrhea, intestinal gas and abdominal pain. 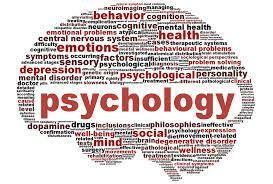 However, its use should be considered because they have a substance that is strong enough so that it can irritate the stomach. If you have a cold, it's good to mix clove oil with honey and drink it once or twice a day to give a warm effect. Besides, rubbing the oil on the nose can also help relieve colds. Clove is one of the herbs that can keep the body to stay warm either if chewed directly or by applying oil on the cold body is also very effective to give a sense of warmth. There are various studies that link the benefits of cloves with sinusitis problems. How to use is to use clove powder and put it on the inside of the nose. It has been a long time that heart disease has become a frightening specter of the world's population. Eugenol content in cloves serves to prevent clots in the blood that prevents the occurrence of heart disease and stroke. 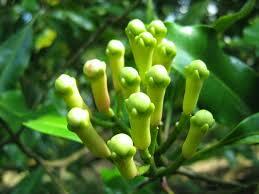 Chewing the cloves can cure the cough caused by the itch in the throat. It may be a bit bitter and bitter, but the chemical content in the cloves is a natural expectorant that thins the sputum. Cloves have a variety of antioxidants and various substances that can relieve pain and kill germs that cause respiratory tract infections. The benefits of cloves are also very good to help skin beauty problems and provide important effects for the long term. 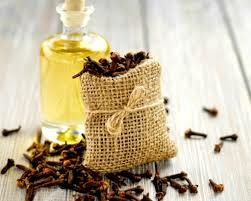 Clove oil is one of the herbs from a variety of studies that are very powerful to get rid of acne. The trick is very easy by applying it on the acne area. The possibility of acne scattered on the face may be eliminated by killing bacteria with the help of antimicrobial properties of clove oil. Clove oil is one of the essential herbs to remove stains and strokes on the skin caused by injuries or other causes. This oil can help make the skin softer so it does not look ugly if exposed to strokes. Clove essential oils are rich in minerals, such as potassium, sodium, phosphorus, iron and vitamins A and C. Very rare oil-shaped herbs have properties that can have good antioxidants to maintain healthy skin and face. Clove oil can be used as a conditioner to correct various problems of hair such as blackening, fixing dry hair and so on. Clove oil can also help prevent hair from loss that can cause kebotokan, very easy way is to apply it on the scalp 5-15 minutes ago in rinse clean. It has been a long time since the benefits of cloves are taken for the use of dental pain medications, especially clove oil. Clove oil (Eugenia aromatica) can be produced from distillation of dried clove powder (clove oil), clove stem oil, and clove leaf oil. Doctors have suggested the use of this clove oil for dental pain relief as an analgesic. Overcoming toothache, cavities are clogged with cotton that has been dripped with clove oil. Or, 10 grains of cloves roasted until smooth, then finely ground, put in the hole of a tooth sufficiently, then covered with cotton. Do it twice a day. Cloves have surprising properties. In food as small as cloves contained many beneficial substances such as anti-inflammatory substances, antibiotics, and essential oils. Cloves are useful for treating toothaches, preventing inflammation, and maintaining the digestive system. Cloves are also useful like other spices that warms the body. 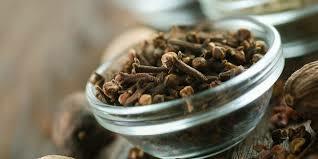 Cloves can also cope with sinusitis and help stimulate the release of retained mucus. Cloves are also good for beauty such as removing spots on the face and curing inflammation due to acne. 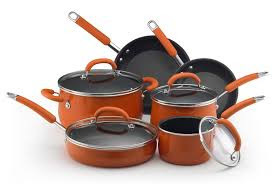 In cooking, cloves are commonly used as a flavor enhancer such as curry, curry, kebuli rice, and so on. Middle Eastern cuisine contains a lot of cloves as a flavor enhancer. Not only that, cloves can also be used as decorations such as nastar cake, sponge, and so forth. Dry cloves can be stored for months in an airtight container. Fresh cloves are not very durable and easily wilt. While powdered cloves are also easily moist when not stored in an airtight container. Whole cloves are usually not mixed in spices because they can cause the cloves to dominate too much. The most classic way of expressing the aroma of cloves in cooking (especially the soup) is by wrapping it in conjunction with other spices in a cloth bag or gauze. Using this infusion technique, the aroma of cloves will blend with the cuisine and does not dominate the original taste or smell of cooking.